I must start this by stating that I'm going to rush out and buy Spore the moment it hits the shelves. This game is as innovative as Sim City and The Sims were for their time. Will started out with a great talk about story and plot development and the contrasts between games and film. The second half of the keynote was a live demo of Spore running on his laptop. It looked a lot more polished than the previous Youtube videos I'd seen to date and I really hope it's ready for release soon. He gave no indication about when it would, but the rumor mill thinks it will be this fall. The whole keynote is on YouTube in seven parts. We skipped out on this one when it became apparent the room was crowded and too warm. Instead we went to Rio Grande for lunch and a mini margarita before heading to the Will Wright keynote. 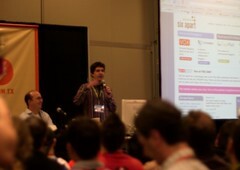 It was very interesting to hear all four browsers battle it out in this type of forum. Here's the basic rundown. AOL didn't say much, Microsoft wouldn't say much, Mozilla said a lot but wouldn't say a few things and Opera talked them all under the table. 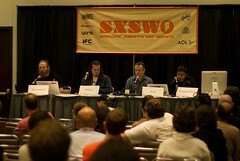 They all pretty much agreed that the web is better now than during the last major battle in the war on standards. Microsoft admitted it had a way to go on catching up with the standards and FF talked about some recent progress in that department. 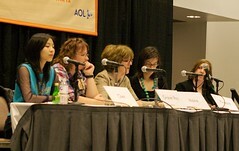 The entire panel either agreed or didn't quibble that Opera was the most compliant. They also unanimously agreed that it didn't rightly matter since the majority of the web has been written with broken browsers in mind. I don't remember the exact numbers, but twice as many of the top 100 sites are using strict mode now versus a year ago. Interesting but somewhat prophetic. Elsewhere in the conference I heard someone say that the best way to prevent the future is to predict it. Raskin is definitely predicting his version of the future. He had a few good ideas and many that I didn't agree with. The good ones involved getting rid of the barriers and making things easier for the user to find. The exact methods he stated didn't seem like they accomplished all of that. 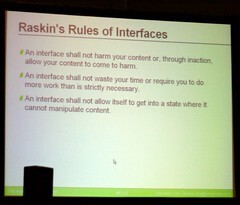 An interface shal not harm your content o, through inaction, allow your content to come to harm. Noble rules but not always practical. I had originally thought this would be a talk about the death of the desktop and the rise of the web application but it was nothing at all about web design or development and all about replacing the windows desktop with something that looks a lot like a predicting command line. Of course those of us running Linux or OS X already understand the power of the command line and if we're geeky enough we can even have context sensitive completion. I'm sorry if I'm not impressed, but I don't think it will catch on. 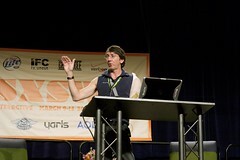 Raskin inadvertently demonstrated a shortcoming of the command line. He was trying to enter a command and had to try three times before he spelled it right enough for the computer to figure out what he wanted. Almost interesting. Sorry, but I only attended because there wasn't much else happening and the 25 minutes sessions were proving to be all fluff. There was a viewing of some videos, flash animations, and samples of rendering tools. Most of it I'd already seen and some of it was downright old news. The only thing really cutting edge was some of the facial tracking and rendering software. Of course none of this really matters to me since I'll not likely be able to afford the software, let alone the render farm it would take to produce results. An interesting talk about something I didn't understand because it's just too simple. I've always wondered: "Isn't this just a pile of attributes on html elements?" and yes, that's all it is. There's nothing to understand, it's that easy. All that being said, it's simply a way to publish information (that you already publish) in a machine readable way. Even if the data's there you still need a client to handle it. Check out the"Operator" plugin for Firefox for some cool gadgets. If you run across a site with a hCalendar entry for an event the Operator plugin can toss that event over to google for you. It can also add contacts to various applications and with some help it could send someone's number to your phone via bluetooth. I'll be adding my own hCard here soon. I didn't pay much attention to this session. I was more intent on catching up on some email and feeds since I was finally able to get a reasonable connection on my table. Mark took some notes so hopefully he will post something when he gets time to process it all. I did like the attitude of Joe Swanberg when he was asked about YouTube and the like. His only concern is that people see his work and he thought it is great that the web enbales more people to see it. 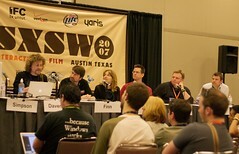 The only panelist that I was familar with was Jane Pinckard and that's only through occasionally reading her articles. This session appealed to me because I have a 10yo daughter who's into gaming and I was interested in understanding her attraction to the games and hopefully help me pick appriopriate games in the future. I'll just jump in and expand on what they talked about and tie it in with what I observe about my daughter. RPGs are like paper dolls! Well, not exactly, but they provided a good argument that playing games like WOW are similar to playing with dolls. Most of your actions are directed at attaining stuff. Better armor, better accessories, better weapons. I really see this with the Wii. My daughter and son have spent countless hours designing Miis for all their friend. Men learn by diving in and poking buttons. Women tend to watch for a while and won't jump in until they understand how the game is played. I've seen this already with my kids. Travis jumps into a game, bashes around a while and stomps off mad when he can't figure it out. Hannah will hand me the controller and watch until she's satisfied that she can play and then proceeds to enjoy the game. More girls would enjoy FPS if the female avatars weren't nerfed, hypersexual or ugly. I've seen this before. The male characters get a choice of 5 or 6 burly avatars and the females get a large breasted amazon in chainmail. Simply spending some more time on artwork and building a few more female characters would open up a significant market. They also talked about the number of women playing male avatars in a game and the number is so low it's not worth paying attention to. On the other hand a large percentage of men play female avatars, especially in games like WOW and Second Life. 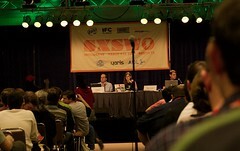 Overall it was a good session and I learned a bit about what to expect as my daughter matures. Hopefully it will help me make good choices when picking games for her Christmas stocking.